Merry-Time Festival of Trees at the Door County Maritime Museum in Sturgeon Bay. Photo by Len Villano. 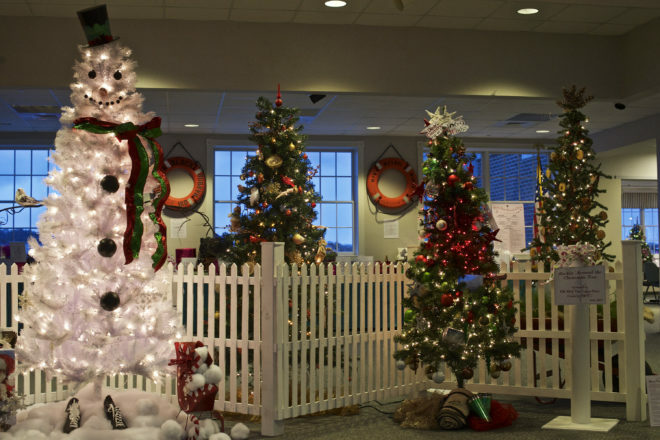 On Dec. 11, 5:30–8:30 pm, the Door County Maritime Museum’s (DCMM) Merry-time Festival of Trees culminates with the popular Jingle, Jingle, Mix & Mingle Gala. Guests will enjoy live seasonal entertainment, heavy hors d’oeuvres courtesy of Thyme Cuisine, along with a live and silent auction and tree raffle drawing. The gala offers a fun evening at the museum and helps support DCMM year-round operations, mission and educational programming. The gala includes a raffle in which attendees may win one of the 28 trees and wreaths donated and decorated by local businesses and organizations. Each of these trees is adorned with ornaments and special surprises. Along with the tree itself, winners will take home the tree’s unique gifts and prizes. The gala also features a dramatic live auction with the following prizes: a Door County golf package, a Björklunden seminar, Hatch Distilling Company tasting and tour, Packers Indoor Club Package for the Lions game on Dec. 30 and Fourth of July fireworks viewing atop the Cana Island Lighthouse. Tickets are $35 in advance or $40 at the door. Purchase advance tickets online here or by calling 920.743.5958.